The Lebanese community in Queensland began as a small relatively segregated group. These immigrants were known as 'Syrians'. Faced with limited employment options, yet determined to improve their economic status, most Lebanese men and a significant proportion of women started life in Queensland as hawkers and, as a result, they spread widely and thinly through the colony and then state. 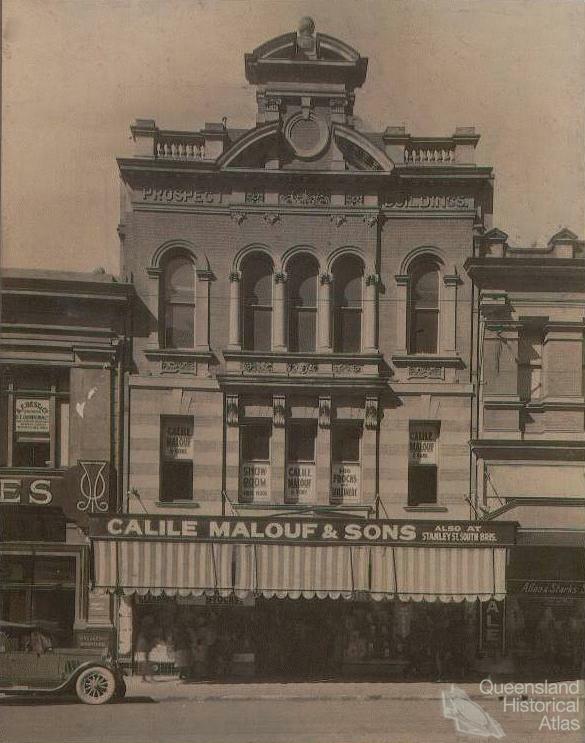 In 1890, Lebanese were operating as hawkers in Brisbane, Townsville, Charters Towers, Barcaldine, Rockhampton, Maryborough and Toowoomba and the Darling Downs, and by 1895, they were also located as far north as Thursday Island, in western towns such as Normanton, Croydon, Winton, Longreach and Charleville and in other towns along the coast. While there were noticeable concentrations of Lebanese in Brisbane and Toowoomba, Lebanese settlement in Queensland was characteristically dispersed. Applicant is a hawker and follows that occupation all over the Darling Downs, has no settled place of abode and he and his wife and two small children sleep in their van in which they travel about in when selling their wares. At other times, family groups covered new territory often travelling for months. Jemillia, was 10 when she arrived in Sydney with her father and brother towards the end of 1891. After a short time in Sydney, Jemillia travelled with her father, uncle and brother as they hawked through Brisbane, Toowoomba and other places in Queensland, finally stopping in Longreach where her father opened a store in November 1894. 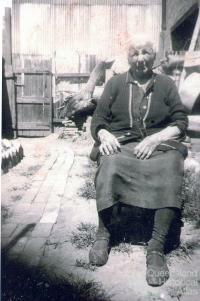 Ten years later her father and brother returned to New South Wales but Jemillia remained in western Queensland because in 1897 she had married Michael, a Lebanese draper who had settled in Longreach in 1891. Once established, Syrian hawkers travelled by horse and cart and then by car or truck, often covering a defined route and continuing to hawk even after starting a store. Elien George, for example, began hawking in Rockhampton and district in the late 1890s. 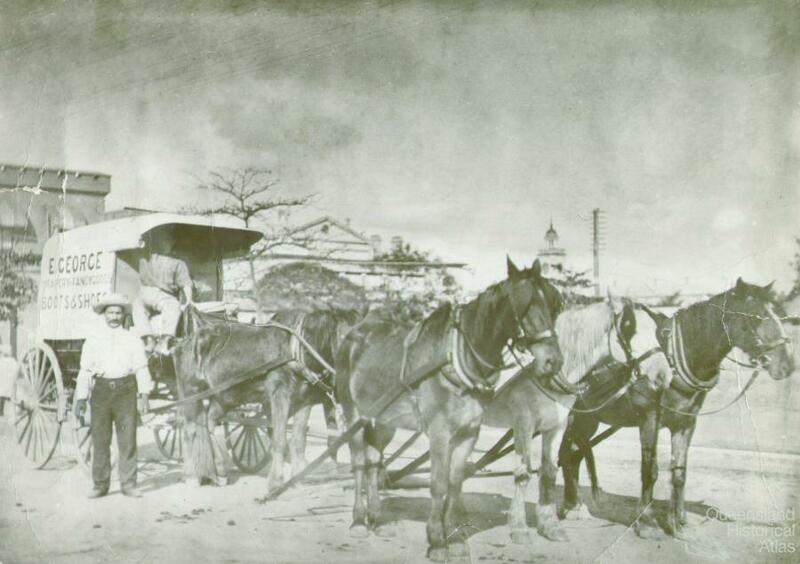 Starting with pack horses, then a wagonette drawn by five horses, and eventually a 1929 Chevrolet, Elien, and later his son, travelled selling goods from Mackay to Many Peaks and Emerald to Emu Park. 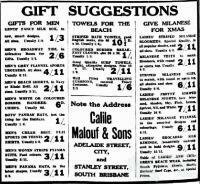 The retail business established by Elien in Rockhampton more than 100 years ago still operates. Hawking was an occupation that required no particular training, little capital and minimal English skills yet provided an immediate cash income. So, for these Arabic speaking, non-European immigrants, hawking was a viable first job. When Michael and his sister, Mary, landed in Sydney in 1899, for example, they could not afford the fare to Toowoomba. So they bought two suitcases of goods on credit from a relative and set out on foot from Sydney on Christmas day. Selling goods on the way, they reached Toowoomba on Easter Sunday. Police records show that despite it being an arduous and potentially dangerous occupation, Lebanese women hawked independently as well as in partnership with their husbands. Although they sometimes worked together, Clara Lahood Joseph, a registered hawker, frequently went to Gin Gin and hawked ‘among Kanakas by herself without the protection of her husband’. In Brisbane in 1901, Syrian women carrying bundles were observed being transported in a cart from South Brisbane to different locations where they then spent the day selling goods house to house. 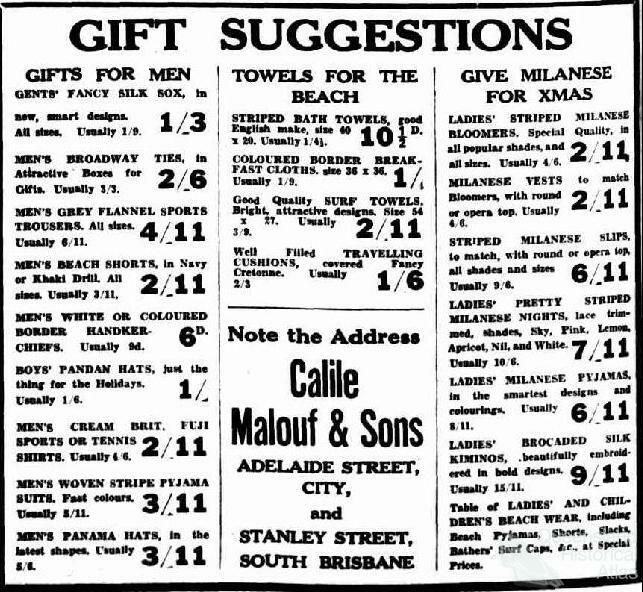 As Lebanese men and women were still hawking in the 1950s, this form of direct selling was obviously an enduring occupational choice and one which met a consumer need, particularly in rural Queensland. In order to avoid competing with each other and to operate a viable business, Lebanese immigrants traversed large areas before choosing a place to settle. By 1899, for example, Mellicks, from Bturrum, Lebanon, had been working in Queensland for at least a decade. Their locations, Maryborough, Rockhampton and Townsville, reflect the significance of Queensland’s coastal and river ports in this period. The first record of Mellicks in Queensland is of five registered hawkers in Maryborough in 1891. Several Mellicks also worked as registered hawkers in the Townsville district between 1892 and 1895. 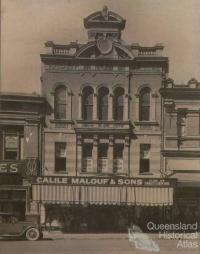 By 1895, a Mellick Brothers drapery store had been established in Rockhampton. Five years later, Mellicks were operating drapery stores in Townsville, Longreach, Blackall and Rockhampton. Once settled, Lebanese immigrants were often deeply attached to their adopted locality. In 1902, after hawking in the Townsville district, Abraham S. Mellick established a store in Geraldton (now Innisfail). In 2002, this store celebrated its centenary and was operated by one of Abraham’s daughters. Abraham chose Innisfail as his definitive home. He developed broad commercial interests and actively supported a range of economic, cultural, sporting, and local development projects. By the 1940s, he had brought his six brothers and two of his three sisters to Australia. Subsequently, Abraham, his brothers and brothers-in-law operated as drapers or mercers in Innisfail, Townsville, Mossman, Tully and Cairns. While their common occupation meant it was difficult for them all to live in the one town; to remain close to their siblings, they settled in a number of towns in the vicinity of each other. We were not just us — we were the only ones in Innisfail — but there was a family in Babinda, and there were four or five in Cairns and there was one in Tully, and at one stage, one of the uncles was in Mossman. But Dad either put them into business or put them on the land, because he had farms then. And so they were all around us and we grew up literally with all our first cousins. This pattern of siblings settling in towns within a region, meant the immigrants and their children were in regular contact but, typically, for the second generation, their experience of being 'Lebanese' was often limited to their extended family. As the children of ‘foreigners’ and isolated in their daily lives from other Lebanese, these Lebanese Queenslanders experienced intense pressure to conceal their difference. In the process of reconciling their Lebanese background with the pressure to become ‘Australian’, they learnt to live in two worlds without belonging completely to either.